On Sunday afternoon, a group of people from Gloria Dei gathered in Cedar Rapids with hundreds of others for the Iowa Multi-Faith rally for Muslims. There were speakers from several different religions and even a representative from a “non-religion” atheist group. 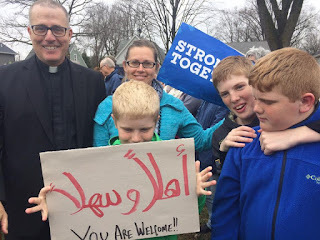 Everyone had wonderful messages of unity in diversity and support for our Muslim neighbors. The event ended with the crowd encircling and enclosing the mosque with peace, salaam, shalom. The rancor, bigotry, and just plain ugly atmosphere of our nation these days has weighed heavy on my heart and has been a constant part of my prayers these last months. This rally did my soul good. In the book study at Gloria Dei we are talking about intercessory prayer tonight, which is prayer one makes on behalf of others. That would include prayer for our world. I’ve always attempted to “pray the news”, but even more so these days. I try to pay attention to what is happening in other countries, regularly reading the international sections (or headlines) of the big papers; the BBC is a great source, as is the Canadian Broadcasting Corporation, as is Lutheran World Relief, Oxfam, and a variety of other international NGOs (non-government organizations). I also subscribe to a weekly email, World News This Week in Prayer, from the website World in Prayer. Sometimes I read those weekly emails and go “What? How did I miss that?” And I am grateful. They pray for both dreadful situations as well as giving thanks for amazing changes in some situations. Many that would have escaped my notice if not for the email. 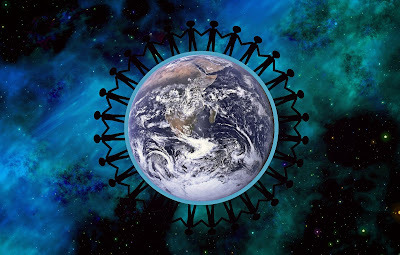 On that website, they also offer resources for how to do this business of praying for our world. They actually offer a 7-week course (which you can download and do as individual or group). So, I’ll share one of their tips and leave you to check out others as the Spirit moves you. Sometimes it helps to have a reminder to pray for those in need; these folks call it a prayer trigger. Think of something you do or touch several times a day. Like: Turning on a faucet, flipping on a light switch, getting in your car, looking at your cell phone, taking a medication. Then think of a world-need related to that action. Turning on the faucet? You might pray for: farmers in Somalia facing drought and famine; refugees in small boats on open seas, trying to escape violence and war; flooding victims who lose everything; those around the world who must walk miles for safe water. Getting in your car? You might pray for: Places with no ambulances or hospitals; children who have no transportation to school miles from their home; homeless who live in cars; those same people who must walk miles for water. Decide on your prayer trigger and specifically what you will pray for each time you do the trigger action and give a try for a few days. Sometimes our prayers need to be turned to action. Like the rally at the mosque or protest marches; letters and phone calls to your congressional representatives; sending money to organizations providing vital relief services, or development support. Sometimes through prayer the action becomes clear. Sometimes you learn that you are the answer to the prayer. Many thanks for these great tips! I am going to check out that website and try the prayer trigger idea. That is great! This poor world needs all the prayers it can get. I hope the triggers are helpful.